The CANopen Master Software enables the user to control and manage a whole CANopen network. It realizes initialization, monitoring, controlling and synchronization of a CANopen network. Configuration processes can be handled very fast due to standardized solutions. The software has been developed according to CiA 301 and in addition to CiA 405 for IEC 11313-programmable devices. VisualCANopen is a software for intuitive configuration of CANopen nodes in a network. The user has a graphical interface for each node and can configure the slave by using predefined masks. Modular, efficient, intuitive – the brand new CANexplorer 4 is a completely new developed field-bus analyzing software for CAN, based on years of experience working with complex machine and in-vehicle CAN networks. 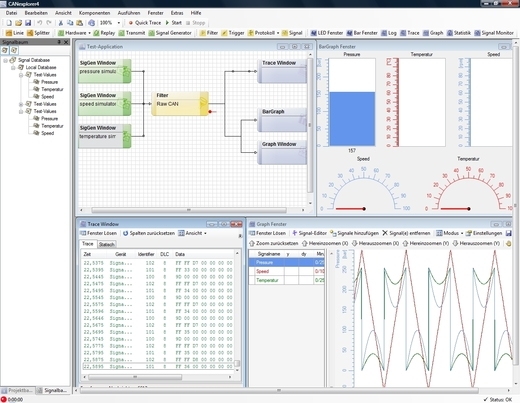 The new modular concept provides all necessary features for analyzing and logging the complete CAN network traffic like classic text-based traces, graphs, bar-graphs, LEDs, filters and triggers. Furthermore, one can use the integrated protocol abstraction for CANopen and ISO J1939 to get pre-processed CAN data. For all proprietary protocols and raw CAN data, one can use the integrated symbol editor in order to define own symbols for abstracting CAN frame values into human readable values. Of course, the logged CAN network data can be replayed for simulation purposes. The test setups are configured by using an intuitive drag-and-drop system where only a few clicks are necessary for preparing new test-setups. In order to enable a simultaneous operation along with other applications on a PC as well as a virtual device Driver which allows testing of all functions without any connected hardware, the CANexplorer 4 finally provides a multithread support for the SiECA132 MT-API with a maximum of 512 handles. More detailed information about the Sontheim software tools for different field-bus tasks, can be found on our website – www.sontheim-industrie-elektronik.de. We are looking forward to your visit.